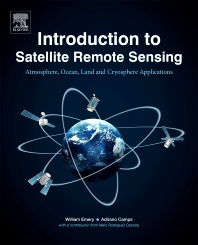 Introduction to Satellite Remote Sensing: Atmosphere, Ocean and Land Applications is the first reference book to cover ocean applications, atmospheric applications, and land applications of remote sensing. Applications of remote sensing data are finding increasing application in fields as diverse as wildlife ecology and coastal recreation management. The technology engages electromagnetic sensors to measure and monitor changes in the earth’s surface and atmosphere. The book opens with an introduction to the history of remote sensing, starting from when the phrase was first coined. It goes on to discuss the basic concepts of the various systems, including atmospheric and ocean, then closes with a detailed section on land applications. Due to the cross disciplinary nature of the authors’ experience and the content covered, this is a must have reference book for all practitioners and students requiring an introduction to the field of remote sensing. William Emery received his PhD in Physical Oceanography from the University of Hawaii in 1975. After working at Texas A&M University he moved to the University of British Columbia in 1978 where he created a Satellite program. He made professor in Aerospace Engineering Sciences at the University of Colorado in 1987. He is an adjunct professor at Tor Vergata University in Rome. He has authored >182-refereed publications, 2 textbooks and >100 conference papers. He is a fellow of the IEEE and the VP for publications of the GRSS. He received the 2004 GRSS Educational Award and the 2009 GRSS Outstanding Service Award. He is a Fellow of the American Meteorological Society (2010), the American Astronautical Society (2011) and the American Geophysical Union (2012). Adriano Camps received his Ph D in Telecommunications Enginering from the Universitat Politècnica de Catalunya in 1992. He is an IEEE Fellow and Full Professor at the Universitat Politècnica de Catalunya-Barcelona Tech, where he teaches Remote Sensing courses, other disciplines relates to Electromagnetism, and a course on Small Satellites. His research interests are microwave radiometry, with special emphasis in synthetic aperture radiometers, and GNSS-R. He is now developing nanosatellites to tests innovative remote sensors, and in particular a GNSS-R payload. He has published over 145 journals papers, and 325 conference papers. He has advised 20 Ph D Theses (+5 on going). Great book, complete and clear. For students or professionals willing to complement their expertise in a different topic.